For men, shopping for an engagement ring can be extremely intimidating; for women, it can be beyond exciting. It’s important for everyone involved in buying an engagement ring to understand what makes a good diamond, and this understanding makes taking a look at very very expensive, superb rings a whole lot more fun. The quality of diamonds in engagement rings are generally determined by the “four C’s.” These include diamond carat, clarity, color, and cut. The “four C’s” affect the quality, price, rarity, and beauty of diamonds. The carat of a diamond is its weight. A one carat diamond weighs 200 miligrans, or one-fifth of a gram. Weight is expressed in fractions of carats for diamond smaller than one carat. The significance of the carat is that it pretty directly relates to the diamond’s size. While the diamond’s cut is definitely a factor in its size in relation its carat, a rough estimate is that a one carat round diamond usually has a diameter of about 6.5 millimeters. It’s important to note that this doesn’t mean a half carat diamond is half that size. In fact, a ½ carat round diamond measures about 5 millimeters in diameter, while a ¼ carat has a diameter of about 4 millimeters. It’s essential to remember that these measurements aren’t exact and can vary significantly. Carat weight is obviously biggest factor that determines the price of a diamond. It’s imperative to know that a one carat diamond doesn’t simply cost twice as much as a similar-looking ½ carat diamond. Because larger diamonds are much rarer, the price of a diamond rises exponentially with size. These flaws can be inside of the diamond or on its surface, and include such things as white dots, black dots, cracks, bubbles, and scratches. 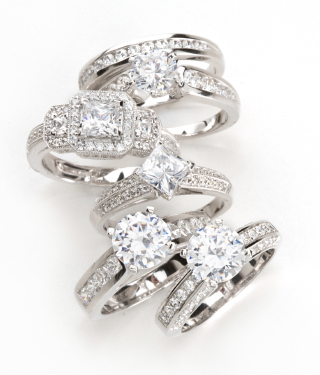 Diamond clarity grades range from “F” for entirely flawless to “I1-I2-I3” for included. Notably, only the “included” category of diamonds have flaws that are visible to the untrained, naked eye. Because of this, shoppers looking for a nice stone but don’t want to spend a fortune usually choose a diamond in the VS category, which includes a few flaws that are barely visible under 10x magnification. Another good option is a diamond in the SI category, which has flaws easily seen under magnification, but not to the naked eye. Diamonds come tinted in many different colors, with diamonds that aren’t “white” often available only at very high prices. White diamonds have color grades that go from D to M, representing the most white diamonds that have no color at all to diamonds that have an off-white tint. D, E, and F grade stones are rare and extremely expensive. The whitest diamonds most available in the engagement ring market come with G, H, and I ratings. They appear colorless to the naked eye, and even under magnification when face-up. Diamonds with ratings of J through M exhibit a clear yellow tint. While these aren’t considered anywhere near top-of-the-line and can be much less expensive, some people seek them out because of their warmer tones. While the traditional engagement ring holds a round diamond, other customary cuts include oval, marquise, pear, and emerald (rectangular). The princes (square) cut is also increasing in popularity. Novelty shapes like the heart are becoming increasingly available, but usually at very high prices. The quality of a diamond’s cut helps to determine its price, as the proportions of a diamond affect its brilliance. In other words, the quality of the cut (of any shape) significantly influences how light travels in and reflects out of a diamond. Well-cut diamonds that offer the biggest “sparkle” are more expensive than diamonds with poor proportions. A good understanding of the “Four C’s” makes looking at the world’s most expensive engagement rings a lot more interesting. Moreover, only a person who understands the characteristics of diamonds can truly appreciate the exquisiteness of some of the most fabulous rings ever gifted. Donald Trump’s ring for Melania Knauss: Donald proposed to Melania with an extraordinary 12 carat, emerald cut ring. Its beauty isn’t just in its size; it also came with an F (for completely flawless) rating in terms of clarity, which gives the ring an incredible sparkle. Donald chose to set the diamond in a plain platinum band, which highlights the beauty of the diamond. He also chose to have the ring engraved for Melania. The engraving reduced the initial value of the ring, which was $3 million, to a (still whopping) $2 million. Donald purchased the ring from the House of Graff, the most famous and well-respected diamond dealer in the state of New York. And while Donald unsurprisingly boasted that he purchased the most expensive engagement ring ever, this wouldn’t be true for long. Paris Kasidokostas Latsis’s ring for Paris Hilton: Although this couple’s time engaged before their break-up was small, the ring Paris Latsis bought socialite Paris Hilton certainly wasn’t! For five months, Paris donned a huge 24 carat, canary yellow, emerald cut diamond ring, which she picked out herself. The ring is worth an estimated $4.7 million, more than twice that of the ring Donald bought for Melania. Jay-Z’s ring for Beyonce: Jay-Z’s net worth is estimated at about 940 million, so it’s no surprise that he spent a $5 million on an incredible ring for Beyonce. Because the couple tried to keep their engagement a secret, Beyonce never wore an engagement ring. Thus, her stunning wedding ring is in engagement ring style. The extraordinary 18 carat, emerald cut diamond is rated “IF” in terms of clarity, meaning that it’s almost entirely flawless. Its astonishing sparkle comes from its “E” color rating. Lorraine Schwartz designed the ring, who mounted it on a thin platinum band that splits near the diamond, creating a distinctive, somewhat antique look. Michael Douglas’s ring for Catherine Zeta Jones: Michael Douglas proposed to Catherine Zeta Jones with a stunning 10 carat, marquise cut, antique diamond ring. Its clarity is rated “IF,” meaning that it’s only barely flawed internally. The ring was designed by Fred Leighton in the 1920s, which makes its perfect “D” color rating surprising and hugely heightens its monetary value. The dominant diamond is surrounded by 28 smaller stones on a platinum band. It’s estimated to have set Michael back about $2 million. Tom Cruise’s ring for Katie Holmes: Tom Cruise’s engagement ring for Katie Holmes features a jaw-dropping 5 carat, oval shaped diamond, uniquely set in platinum rose gold. It’s worth approximately $1.5 million, mostly because of its platinum rose gold, along with its perfect “F” clarity and “D” color ratings. Ben Affleck’s ring for Jennifer Lopez: This couple split up before their wedding, but that doesn’t make the ring Ben Affleck gave to Jennifer Lopez any less incredible! The ring is worth over $1.2 million, which Ben spent at Harry Winston. It features a beautiful 6.1 carat pink diamond along with three smaller white diamonds. Because pink diamonds are so rare, the color significantly adds to the ring’s monetary value. Ben Affleck’s ring for Jennifer Garner: Ben Affleck doubled the appearance of his name on the “big spenders when it comes to romance” list with his ring for Jennifer Garner, whom he actually did marry! Ben went back to Harry Winston for this 4.5 carat ring, which cost him approximately $500,000. Tony Parker’s ring for Eva Longoria: Tony hired world-renowned French jeweler Jean Dousset to create an original ring for Eva, setting him back $500,000. The ring features an incredible 5 carat, emerald cut diamond with perfect clarity and color ratings of “FL” and “D.” The ring also includes a total of 248 tiny diamonds covering its platinum band, creating a classic and classy look.